Did you invest in Microsoft Dynamics 365 for Sales (CRM) only to discover that no one is using it? Are your users stuck in their old habits instead of embracing the new system? Don't worry! You aren't alone. 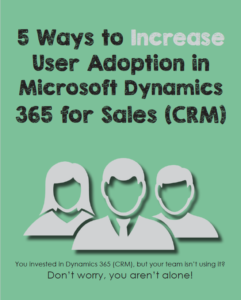 User adoption is the biggest issue businesses face when implementing Microsoft Dynamics 365. Download our latest eBook to understand the five tips to increase user adoption. You don't have to be the bad guy: no more nagging calls asking your team to enter the information in Dynamics 365 and no more weekly reminders to your team to track their email correspondence. Start with the winning game plan from the beginning! Download our free eBook today. Written By Elise Rooney, Marketing Specialist at Rockton Software, an application provider for Microsoft Dynamics 365. Check out our business applications, now live on the Microsoft AppSource.